Moved by the headlines about the tragedy in Syria and Iraq, and the growing threat of ISIS, I wondered how these developments might feel from the perspective of a religious minority in Homs, Syria. I imagined a vulnerable Christian community threatened by the onslaught of the Islamic State, as the world suddenly changes dramatically for the worse. Soon, I envisioned a young Syrian-Christian woman fleeing fear, violence, and tragic loss, and eventually finding a new life as a refugee in the United States. That’s how Anissa was born. 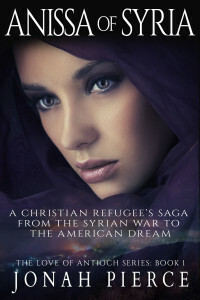 The Love of Antioch series is her story. It is a story of survival, love, and the triumph of the human spirit. Anissa’s saga is told as a first-hand account of her gripping experience, in diary form.